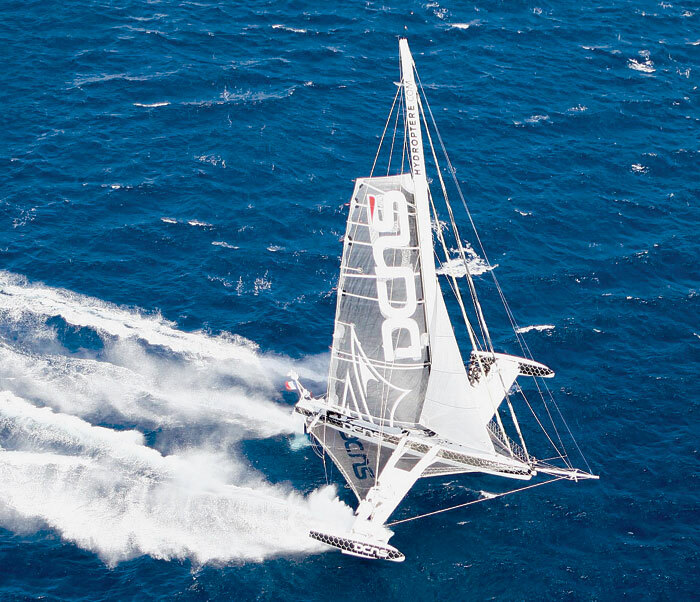 LOS ANGELES — After watching the long-range weather forecasts for more than a month, team l’Hydroptere DCNS and its 60-foot trimaran foiler decided to hold off on its Transpacific crossing record attempt from San Pedro to Honolulu. Instead, the world-record-holding boat headed north to San Francisco Bay to appear with the AC 45 catamarans racing in the America’s Cup World Series event, Aug. 24-27. Without the wind needed to potentially set a new record in the long-range attempt, Frenchman Alain Thebault and his crew could not pass up the opportunity to race against the AC 45 sailboats and continue training in the high winds of San Francisco Bay, and also set the first certifiable one-mile sailing speed record on San Francisco Bay. The attempt came Aug. 31, with a one-mile speed course set up by experienced race committee representatives from a half-dozen local yacht clubs and associations. The course setup was angled between the Golden Gate Bridge and Alcatraz Island, in winds of 16 knots gusting to 20 knots. Thebault and his crew including Jean Le Cam, Jacques Vincent, Yves Parlier, as well as several other sailors, covered the distance at an average speed of 37.5 knots. The winds were lighter than usual for San Francisco Bay, but had winds been high enough to demonstrate the boat’s full speed potential, safety considerations in the heavily trafficked bay suggested a limit of 45 knots. The boat has flown at 56 knots, and reached a top speed on the bay of 44.5 knots on Wednesday. Sustained speed, such as over a one-mile course or ocean passage, is a harder challenge than top speed. The trimaran, which cruises above the water on hydrofoils, utilizes only sail power. It sailed from Long Beach under the command of co-skipper Jacques Vincent with four crewmembers: Emilie Monthioux, Luc Alphand, Jeff Mearing and Warren Fitzgerald. Skipper and project founder Alain Thebault traveled by car to make arrival preparations. “It has been an important delivery trip — very intense and wet,” Vincent said. “We left Long Beach in very sunny conditions and almost no wind. l’Hydroptère DCNS is the world’s fastest sailboat, having in 2009 reached a sustained speed of 50.17 knots (58 mph) over 1 nautical mile and a top speed of 56 knots (64.4 mph). At 60 feet in length, with a 79-foot beam and a height of more than nine stories, the boat combines aerospace and marine technologies, using hydrofoils and a newly developed stabilization system to lift the boat and attain stable wind-powered high speeds on the open ocean. The boat’s name, conceived by Thebault, comes from a pairing of the Greek words water (hydros) and wing (ptere). While l’Hydroptere DCNS has shown its world-class ability in short distances, Thebault believes the punishing long-range voyage to Honolulu will showcase the vessel’s seafaring capability. With the San Francisco Bay record in hand, the crew will once again view the weather forecast to determine when to head south and begin preparations for the transpacific crossing. ← Cemetery to Use Dredged Harbor Sediment?